When we say iron, we mostly mean steel, a stronger combination of iron and carbon. Steel is a without post-treatment malleable alloy of iron with a reduced carbon content (0.5 to 2%, usually < 1.6%). Cast iron has a higher carbon content, namely + 2%, and is not malleable. There are more than 2,500 different alloys with these two elements, mostly also with other components. Steel has many properties that are depending on the application more or less desirable: brittleness, corrosion resistance, elasticity, hardness, hardening, heat resistance, durability cut, weldability, yield strength, impact resistance, wear resistance, ductility, malleability, melting point, chip formation, strength, strength in heat, toughness. Different elements in the composition can alter the properties: manganese, silicon, sulfur, phosphorus, nickel, vanadium, chromium, molybdenum, cobalt, tungsten. The last 5 provide better hardness and strength. Molybdenum is not conducive to the malleability. Tungsten makes it more heat resistant. Vanadium improves elasticity and cutting properties. 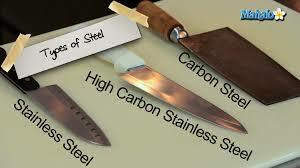 The strength or hardness of the steel is determined by the amount of carbon. 3rd steel measuring tools (1.2 to 1.5% C) (file, tap, caliper,... (fragile)). High Speed ​​Steel ( HSS) retains its hardness at higher temperatures. This makes it very suitable for tools that can become hot, such as metal and concrete drills.